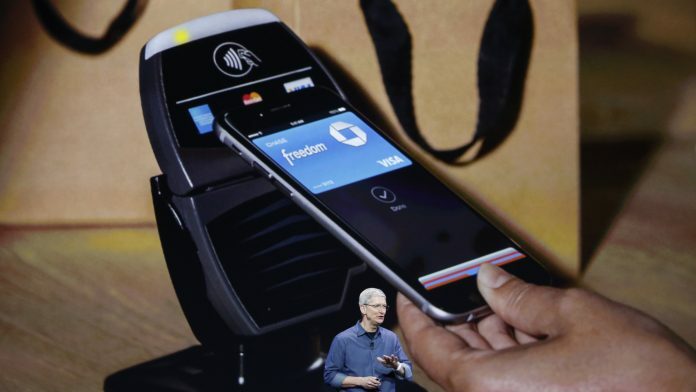 Apple CEO, Tim Cook, announces Apple Pay at WWDC 2015. Starting today, iPhone and Apple Watch owners can use their devices to complete Apple Pay transactions at more than two million retail locations. Stores with chains like Chik-fil-A are expected to add compatibility soon. According to a report by Bloomberg, that was published by Business Times, the initiative’s development rate goes as planned, after the company was able to achieve the goal of rolling out compatibility at 1.5 million retail outlets by the end of 2015. Aside from the stores that offer the compatibility presently, big chains like Crate & Barrel, Chick-fil-A, and Au Bon Pain are planning to integrate Apple Pay as a checkout option in the near future as well. Other than aforementioned, online merchants are also looking to add in-app compatibility with such payments. The most recent example of such an initiative is what Zappos.com did on Tuesday. Cupertino mentioned in a relevant statement that even though the feature is not that well-known, the integration is doing quite well and is on the rise. The report further added that purchase volume has grown more than doubled in the trailing half of 2015, compared to the first six months of the year. Services are considered to be too young till now and there are still apprehensions in the market, leading to delay in people excepting the Apple Pay as a traditional method of payment. The company is, however, looking with renewed vigour ways to change the market that is currently largely dependent of swiping cards. Apple is also looking to extend this service to China as part of a partnership with card processor Union Pay. This will provide a region of massive growth potential both for payments and the company’s hardware.